There are few sequels that managed to instantly erode/negate the goodwill generated by their superior, classic predecessors. 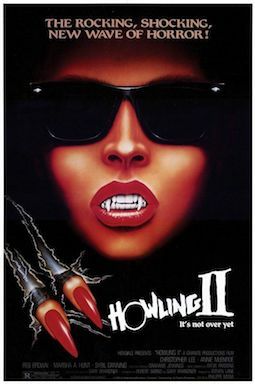 Howling 2 is one such film. However it’s an interesting and unintentionally hilarious failure. Featuring the unlikely bizarro casting of the legendary Christopher Lee alongside bumbleheaded naif Reb Brown, Howling 2 asks the question, where’s Joe Dante when you need him? The original director didn’t want anything to do with this one and rightly so. The subtitle is Your Sister is a Werewolf and that comes into play as Ben (Brown) loses his sister to one of the savage beasts, and she becomes one. He seeks the help of the awesome Stefan Crosscoe (Lee) to explain the lycanthrope mystery. There’s much to be said about Howling 2 and said exploits. There’s a hairy menage-a-trois (luckily not involving the aforementioned stars), and a glorious exploitation strip tease involving the incredibly hot Sybil Danning, who plays Stirba, Queen of the Werewolves. There’s a hunchback Romanian innkeeper, some switchblade-wielding punks and a terrific score. So while this isn’t Godfather 2 territory sequel wise, it’s at times a hoot. Join us. Find more reviews www.reallyawfulmovies.com, and be sure and subscribe to weekly episodes of the Really Awful Movies Podcast.